This week’s loss was a good one. I knew that the slight holiday gain I had last week would drop right back off, and sure enough, it did. This puts me on pace to lose about 16 pounds during post-op month 6. I’m glad to be headed back to school tomorrow because it means that I can get back into a routine, which has been important in my success so far. Today and tomorrow, I’ll be chipping away at my 100 workouts in 2014 goal, and focusing on moving more during the week. Friday night I plan to give my first Zumba class a try. I have friends and family who do it, love it, and swear by it, so I’m hoping I have a good experience with it. Today marks the day that I have finally lost 100 pounds as a direct result of the surgery, just a few days shy of 6 months out. Recall I lost 37 pounds prior to surgery due to pre-op dieting and generally cleaning up my eating once school ended last June. The loss of 100 pounds in roughly 6 months is a pretty good rate of loss–it works out to a little over 16 pounds per month when you do the math. I’m really happy with how my body has responded to my new stomach. I love that I am finally on a level playing field with other folks who are trying to lose weight at this time of year. Some folks might not see it that way, but I do. I am less than 40 pounds away from my surgeon’s goal weight for me. I am less than 90 pounds away from my goal for me. This is exciting and scary at the same time. It’s exciting because I had not expected to be this close to either target at this point in the game. It’s scary because now I really am in uncharted waters weight-wise. I know that every time I post a progress report, I comment about how “this is the smallest I’ve ever been as an adult” and all that, but you have to understand how trippy this is for me. I don’t know how to be small! I’ve only ever been big, and separating the mental chaff that comes with that identity and body from the new body I’m building for myself is tough. This is something I will have to work on constantly as I remind myself that I am no longer a 400-pound person. I don’t move like one, I certainly don’t look like one, and I damn sure don’t feel like one, physically. Psychologically…I still feel like the biggest person in any room even though this is no longer true. Sometimes I find myself negotiating physical spaces as though I were much larger than I actually am. I have trouble conceptualizing that I fit into smaller spaces now. I’m having trouble with the fact that I no longer exceed the weight limit for machines at the gym, ladders, or stepstools, or anything else that thin people take for granted they can use because they’re light enough to. I’m getting used to the idea that if I sit on a wall-hung toilet, I won’t break it off the wall. I’ve actually done this, sad to say. Twice. I don’t know how to be a thin person. And this is a scary thing. Imagine being one way your entire life. You only know this way to be, because it’s been your identity for the entire time you’ve been alive. This is the way everyone knows you, and this is how they identify you. Then, gradually, your identity changes. You’ve initiated the change because your old identity came with a lot of baggage (literally and figuratively) and the change makes you feel good physically. The change you make improves your overall health. But the change in identity brings with it a lot of upheaval. The change leaves some pretty nasty mental debris and physical artifacts behind that don’t make you feel good about yourself some days. The change uncovers a lot of things that make you uncomfortable. Isn’t that what change is supposed to do, though? Make us uncomfortable? This discomfort is hard to get used to, and I know it’s going to last a good long while. More stuff to work out in therapy, I guess. I will keep chugging toward the goal I’ve set for myself for my birthday in March, and then aim for 220 by April 30. If I can hit 220 before April 30, even better. I want to impress the hell out of Dr. Nicholson just like I did Dr. Carlton. I don’t know why this is so important to me, but it is. Today’s eating was carbalicious and full of veggies. I ate a carb-heavy breakfast because I knew I was going to go to the gym and do a cardio workout, which I did. I had a salad and soup for lunch. I roasted some chicken breasts for lunches this week, and also some Brussels sprouts with new potatoes and bacon as a side. Good stuff. I got in 89 grams of protein, 58 grams of carbs and 45 grams of fat. Not terrible, but the fat could be lower. I blame cheese, and the salmon and walnuts I had on my salad. I’m going to try and cut some fat this week wherever possible. 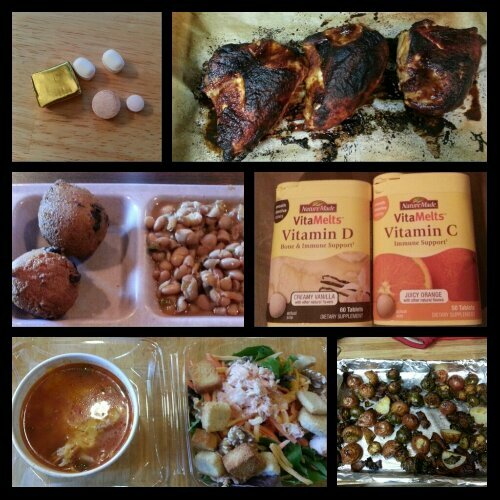 Today’s food choices, from upper right: roast barbecue chicken breast; vitamin C and D supplements; roast Brussels sprouts, new potatoes and bacon; chicken tortilla soup and mixed green salad with grilled salmon; jalapeno hushpuppy and pinto beans and leftover smoked chicken (not shown); multivitamin and calcium supplements x2, iron supplement. 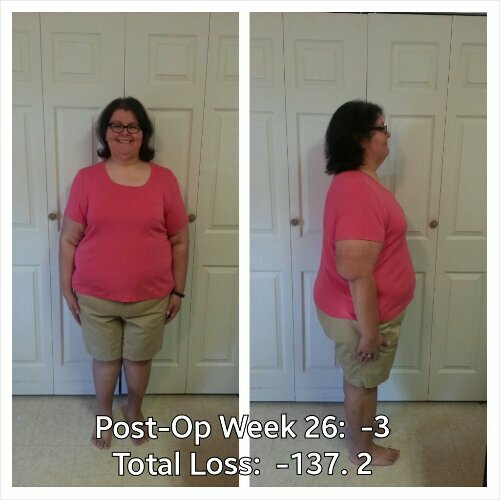 This entry was posted in daily bites, eating, exercise, goals, la guerra, planning, post-op, progreso, success, the sleeve, vsg, weight loss surgery, werk! and tagged daily bites, eating, exercise, goals, meal planning, planning for success, post-op eating, post-op life, progreso, progress report, she's got skillz, sleeve gastrectomy, sorry for sleeve rocking, surgeon's goal, VSG, vsg realness, weight loss goals, WLS, workin' on my fitness. Bookmark the permalink. Just wanted to let you know that you’re not alone. The only time I’ve ever been at a normal weight was at birth. I was 75 pounds in kindergarten and over 200 pounds in the seventh grade. I’m 270 now, although I was 324 at my highest. I have literally no idea what it’s like to be at a healthy weight. My goal is 160 and while I am excited, it also freaks me out as I have no clue about what I’ll look like or how I’ll feel. I am so accustomed to feeling sluggish and out of shape that the idea of “feeling good” is an alien concept to me.